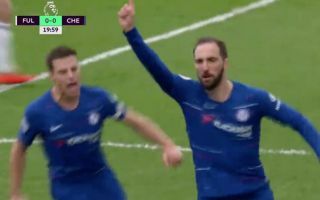 Gonzalo Higuain added another goal to his Chelsea tally this afternoon, as the Argentine gave the Blues the lead in their west London derby with struggling Fulham. Chelsea look like they’re going to need to win today if they’re to keep up in the race for the top four, and they’re well on their way to achieving that following Higuain’s goal in the first half. The goal came after the ball was worked to Cesar Azpilicueta down Chelsea’s right, as the Spaniard crossed the ball into Higuain, who finished well. You can check out the goal below. Fantastic finish from the former Real Madrid man!